GTCHDA donated $2,500 to Madison and Mississippi Heights Elementary Schools. SAINT CLOUD, Minn. - Jan. 8, 2019 - PRLog -- Continuing their support of local schools, Luther Honda St. 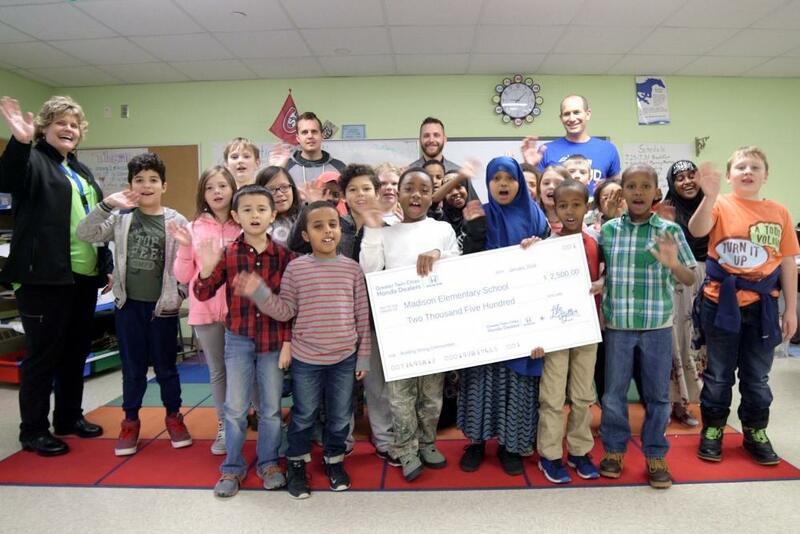 Cloud of the Greater Twin Cities Honda Dealers Association (GTCHDA) started the new year by donating $2,500 each to Madison Elementary School and Mississippi Heights Elementary School. The donations were presented in a ceremony just before the holiday season on Dec. 7. Adam Schlichting, new car sales manager of Luther Honda of St. Cloud, attended both ceremonies. Schlichting delivered and presented the checks to Madison Elementary during a 9 a.m. ceremony at Madison Elementary, and to Mississippi Heights Elementary at a 10:30 a.m. ceremony. The principals of Madison and Mississippi Heights attended their respective ceremonies. "I am thrilled to see such a strong response in the children, principals, and teachers," said Chad Arthur, general manager of the Luther of St. Cloud Honda dealership. "It has been so rewarding to give back to the community and to help support our schools. I look forward to doing this every year because it means a lot to me to be able to support my community in such an impactful way." Madison Elementary School aims to create a safe and welcoming environment for all students in order to prepare, engage, and empower the leaders of tomorrow. Madison believes that everyone deserves fair and equal access to high-quality learning in order to unlock every child's unique potential. The school seeks to bring differing perspectives together in order to create strong communities of lifelong learning. This donation will help fund Madison's field trip initiative. Mississippi Heights Elementary strives to foster a welcoming learning community by creating a caring and nurturing learning environment. Mississippi Heights believes in the development of all aspects of a child and is trained to meet the social, emotional, and academic needs of the many different children they teach. Mississippi Heights empowers students in order to teach them to do their best every day. In the spirit of welcoming, Mississippi Heights plans to use this donation to make their outdoor learning resources and playground facility more user-friendly for their disabled student population. The Greater Twin Cities Honda Dealers consists of eight Honda dealers serving the greater Twin Cities area, which include Buerkle Honda, Inver Grove Honda, Luther Brookdale Honda, Luther Honda of St. Cloud, Luther Hopkins Honda, Mills Honda, Richfield Bloomington Honda, and Walser Honda. For more information, please visit https://www.GreaterTwinCitiesHondaDealers.com.